Richard Francisco (American, b. 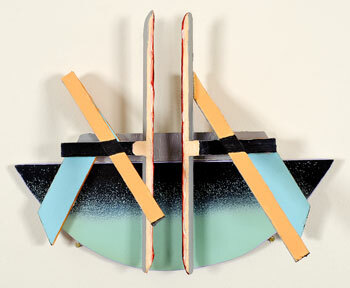 1942), Sixty – Seven and a Half Inches from the Floor, 978, enamel and acrylic on balsa wood, 9-1/4 x 11-9/16 x 5-3/8 inches, 2009.4.8. Dorothy and Herbert Vogel donated 50 works from their collection to each of the 50 states. Beginning in 1962, Dorothy and Herbert Vogel used their modest income as a librarian and postal clerk to amass a vast and uniquely perceptive collection encompassing over 4,000 works of contemporary art. The strengths of the collection include minimal and conceptual art, especially drawings, but it also moves beyond those categories to include art rooted in abstract expressionism, innovative post-minimal approaches and diverse figurative directions. The Vogels befriended many young artists, some at the beginning of their careers, and often purchased works on paper in order to store them more easily in their small apartment. However, their intention was not to build a collection but rather to choose works they wanted to live with. Their enthusiasm earned the admiration of artists. They were interested in a range of contemporary practices, which included works others found difficult to appreciate, and the art community was aware of their commitment to art and their limited funds. The Vogels provided not only modest financial support but also moral encouragement to relatively unknown artists who would later earn international acclaim. By the 1970s, their collection became widely exhibited and recognized by the art press, and they were acknowledged for this prescient attention to these artists. In 2008, with the help of the National Gallery of Art, the Vogels launched the national gift program “Fifty Works for Fifty States,” which distributed 2,500 works from the Vogels’ collection throughout the nation, with 50 works going to the selected institution in each of the 50 states. The University of Wyoming Art Museum was selected as the Wyoming designee, and the exhibition The Dorothy and Herbert Vogel Collection: Fifty Works for Wyoming celebrates this extraordinary gift to Wyoming. The current exhibition is the first time this collection has been shown in its entirety at the Art Museum—only a selection was exhibited in 2011. The Dorothy and Herbert Vogel Collection: Fifty Works for Fifty States is a joint initiative of the trustees of the Dorothy and Herbert Vogel Collection and the National Gallery of Art, with generous support of the National Endowment for the Arts and the Institute of Museum and Library Services. When: Feb. 9–March 21, 2019; a free opening reception for spring exhibitions takes place Feb. 22, 6–8 p.m.